If you can cover beans with water and turn your stove burner on, you can make these beans. From scratch! I believe in us. Let’s do it! For some of you, making beans from scratch may seem like old hat. But for those of us less experienced (hand raised) in the art of buying bulk beans to cook yourself, this recipe is good news. 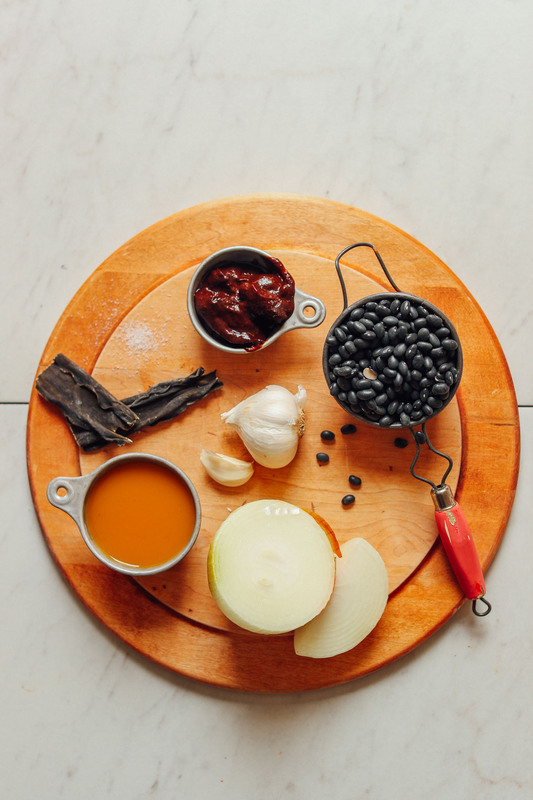 After a little trial and error, research, and testing, we came to realize that if you want black beans that are flavorful, perfectly tender, and not mushy, they actually turn out tastier, less mushy, and deeper in color when you skip soaking before cooking. This is wonderful because it not only saves time, but there’s also virtually no prep time and the beans are ready in less than 2 hours! That’s right! This recipe is super easy, requiring just 6 ingredients and 1 pot to make. Because the beans aren’t soaked beforehand, it’s a good idea to add a strip of kombu (seaweed) to make the beans easier to digest. And for flavor, add a halved onion and some garlic. Another way to infuse more flavor is to add some vegetable broth to the pot. We prefer a ratio of 3:1 water to vegetable broth. Next, cook your beans until tender. Then remove the onion and kombu and simmer for another 10-15 minutes to evaporate some of the extra moisture. This is also an excellent time to add your salt and other seasonings. For a smoky, spicy note, we added cumin powder and two chipotles in adobo sauce. 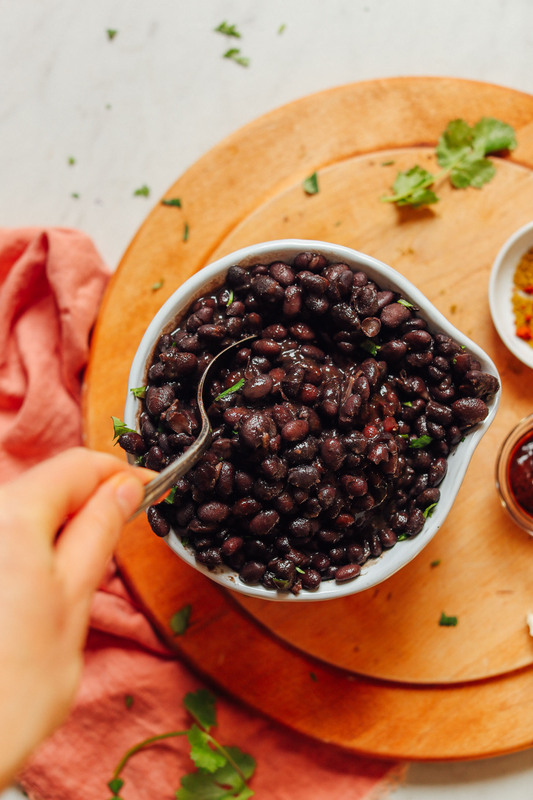 These beans are so delicious on their own, but they would also work well with things like burrito bowls, tacos, nachos, veggie burgers and more! We have a fun recipe coming up that puts these beans to good use, so stay tuned! And if you dig this recipe, also be sure to check out our 1-Pot Pinto Beans! 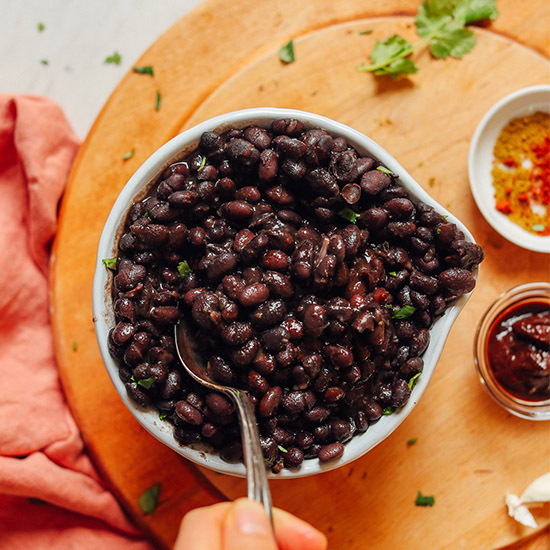 Flavorful, easy-to-make 6-ingredient black beans cooked in 1 pot and that don’t require soaking! 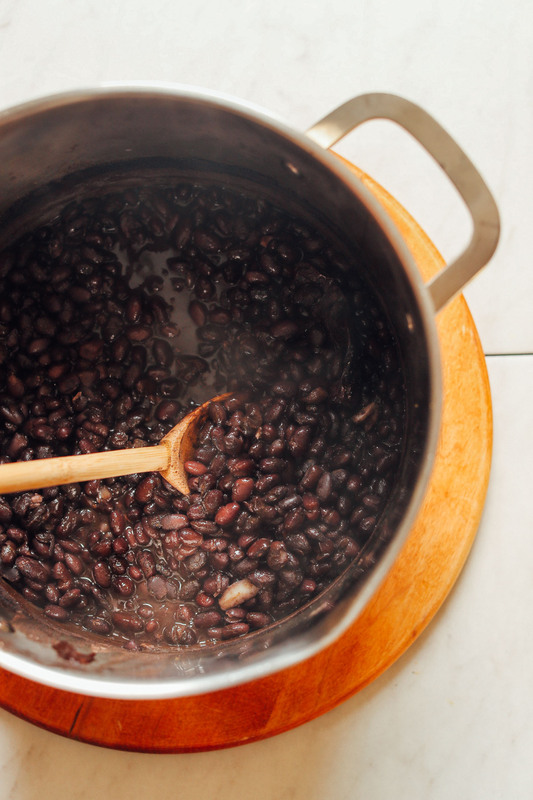 A foolproof way to cook black beans from scratch. Perfect for tacos, nachos, enchiladas, taco salads, and more! 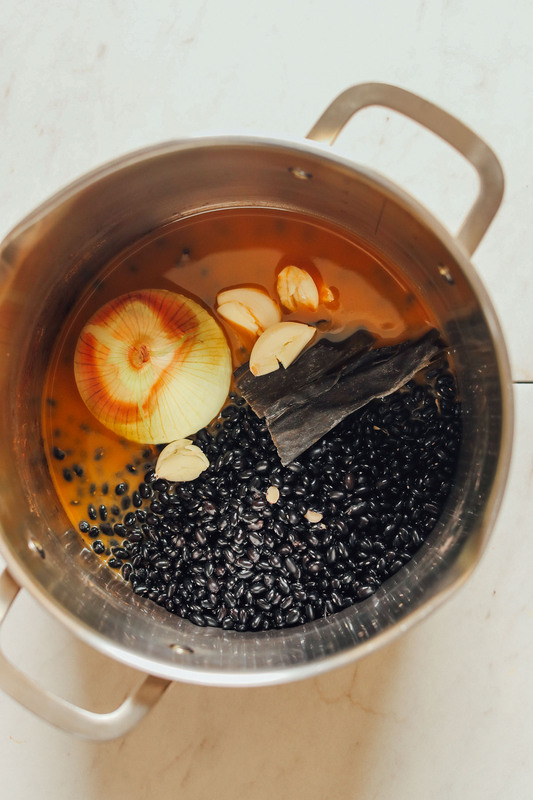 Add beans, onion, garlic, and kombu to a pot and cover with 3 inches water/vegetable broth. We went with about 2/3 water and 1/3 vegetable broth for a little flavor. Cover and bring to a boil over high heat. Then reduce to a simmer and cook uncovered for 1 hour – 1 hour 45 minutes or until the beans are tender. If during that time the beans are no longer covered in enough liquid to cook, add more water or vegetable broth to just cover. Once tender, remove the onion and kombu and scoop out any excess liquid that’s making the beans soupy (some liquid is good, just scoop out any excess sitting at the top). Season beans to taste at this time. We added salt, cumin powder, and 1-2 chipotle peppers in adobo sauce. Then increase heat to medium/medium-high (the beans should be bubbling) and cook – stirring occasionally (uncovered) – for 10-15 more minutes. The liquid should evaporate a bit more. Your beans are now ready to enjoy! These make a delicious addition to burrito bowls, burritos, tacos, nachos, taco salads, veggie burgers, and more. You could also add them to chili! Store beans well covered in the refrigerator up to 5-7 days. Will keep in the freezer for 1 month (oftentimes longer). *1 pound dried beans typically equals 2 cups dried or 4-5 cups cooked. *We didn’t find soaking necessary for texture and flavor. But if you’d like to soak the beans for improved digestibility, soak overnight in cool water, or for 6 hours. Then drain and proceed with recipe as instructed. *Don’t worry – you can’t taste the kombu in the beans. It’s just there to help improve digestibility. *Method adopted from the talented folks at Serious Eats. *Nutrition information is a rough estimate for 1 half-cup serving of 10 total servings calculated with 1/2 tsp salt, 3 cups vegetable broth, and no additional add-ins. The recipe yields roughly 5 generous cups cooked beans.